We are eager to continuously improve Nuki and are creating features that facilitate your daily routine. In addition, we receive messages full with ideas and suggestions how to enhance the Nuki experience on a daily basis. 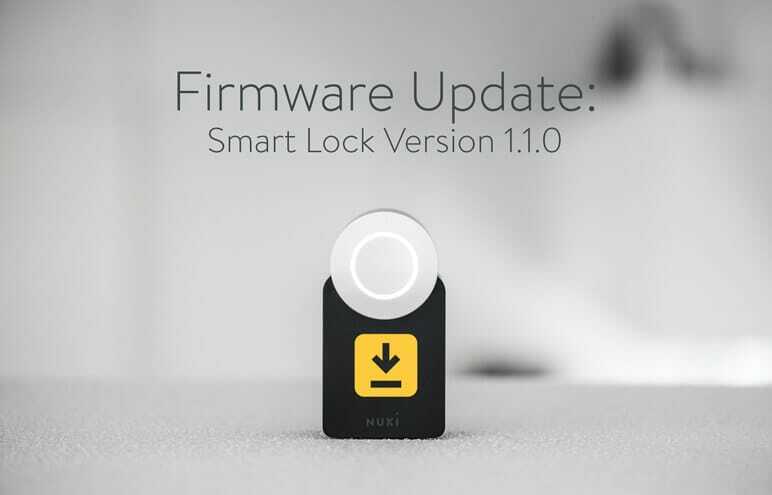 After we have made many small improvements over the last few months, we are happy to announce a major firmware update (version 1.1.0) that will be available for every Nuki owner over-the-air. By using the new firmware you can shorten lock operations, save on battery and have small issues corrected automatically. It’s on you to decide if Nuki should close your lock one turn (360 degrees) or two turns (720 degrees). Of course one time locking is faster and consumes a lot less battery. However, choosing the single lock mode might (in some cases) also have an impact on your insurance coverage. This is why we decided to stick to two turn locking as default setting. If you close your lock using one turn, you can lock it a second time by using the Nuki app. The new firmware allows you to adjust the standby Bluetooth advertising intervals and thus, decide how fast and often your Smart Lock communicates with the Nuki app. You can switch from “Fast” (~0,5s) to “Medium” (~1s) and “Slow” (~2s). Per default we use an automatic mode that adapts accordingly to the frequency of your lock operations. If you have not used your Smart Lock in a while, because e.g. you are on holiday, your Smart Lock will automatically change to “Slow” mode. Once you are back home the slower advertising interval will lead to a slower first unlocking, because it will take longer to establish the Bluetooth connection (about two times the advertising interval). This will only happen when you enter your home the first time after your absence. Afterwards your Smart Lock adapts automatically to faster intervals. The slower the chosen interval, the longer your batteries will last. We expect a total improvement of 25% to 50% if you are using the automatic mode. But that’s not all. We have worked on many small optimizations that will lead to a smoother lock experience in general. For example this includes an automatic retry of lock operations if the motor has been blocked, the autocalibration of the Smart Lock and improvements of the Auto-Unlock feature. We hope you like the new features and are looking forward to your feedback.